Black Casino and the Ghost are a new alternative rock band from London. Drummer Andy Treacey is the best known member having played in bands such as the Tom Robinson band, The Lightning seeds and Faithless until their split earlier this year. Alternative rock is a term that covers an incredibly diverse spectrum of music, so I wasnt sure what to expect from this release - not being familiar with the band, it really could have been anything. Happily though this was a very pleasant surprise when I listened to it. Its got a quirky fun feel to it, and all four tracks are well written, have great tunes and great vocals. "My Bambina" has a fast paced chorus and has a real fun feel to it. Small parts of the music in "Odyssea" have a spaghetti western movie soundtrack feel. It's hard to define why it feels like that, but it certainly doesnt harm the song. This is a great EP. Its got enough of a rock feel to make it interesting but its got a quiet laid back feel to it as well. There's plenty of variety here as well with all four tracks being quite different from each other, but not being so different that any of them feel out of place on this EP. 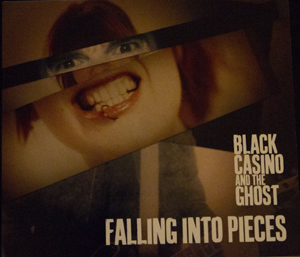 "Falling into pieces" is due to be released on 14th November, and is definitely well worth checking out. I look forwards to hearing more from Black Casino and the Ghost.